Witch hazel works as an astringent with strong antioxidant properties. Besides, it has antimicrobial, anti-inflammatory, sun-protectant, and disinfectant qualities. It absorbs excess oil from your skin but does not make it feel dry. Thus, witch hazel can be used as a natural toner for oily and combination skin. In addition, it clears dark spots and tightens the pores on skin. As witch hazel fights inflammation and contains tannins, it is considered as an easy home remedy to cure acne. Although this herb helps maintain clear skin, make sure you do not use it more than three times in a day. To make witch hazel astringent at home, soak a tablespoon of witch hazel bark in a cup of distilled water for half an hour. Next, boil the solution and then simmer it about 10 minutes. Turn off the heat and let it steep for another 10-15 minutes. Finally, strain the fluid and allow it to cool. • Simply soaking a cotton ball in witch hazel extract and rubbing it on your face on a regular basis makes your skin clean. It also tightens the skin and prevents wrinkles. In case you have normal to dry skin, you may add a few drops of olive oil, jojoba oil, or almond oil in it. Besides, you can mix two parts of rose water and one part of distilled water in one part of witch hazel and then apply. • Similarly, you can reduce under eye puffiness by placing cotton pads soaked in witch hazel (preferably without alcohol) under your eyes for a few minutes. 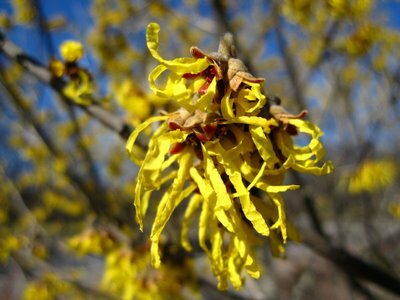 • Treat acne naturally by applying an infusion prepared from witch hazel bark. To make the infusion, steep about five to ten grams of the bark in a cup of boiling water for 15-20 minutes. Finally, strain the liquid. Unlike other skin-care products, this solution does not irritate the skin as it does not interfere with the skin’s pH balance. • In case you do not have the bark, mix two teaspoons of honey, whisked egg white, one teaspoon of witch hazel, and the same amount of tea tree oil in a mashed ripe banana. Apply this facial mask for almost 15 minutes and then wash it off. • Mix equal parts of witch hazel and rubbing alcohol and apply this solution on the affected area to get rid of zits and pimples. • Puree a medium-sized cucumber in a blender and add an ounce of witch hazel extract in it. Apply this on your face and neck as a natural toner. • Combine a quarter cup each of rose water, glycerin, two tablespoons of witch hazel and a tablespoon of sweet almond oil. Use this beauty care recipe as a homemade body lotion. Here’s a video showing how to make a DIY witch hazel and oregano facial toner. • Witch hazel can be used in homemade aftershave recipes to disinfect the skin. For instance, you can make an aftershave lotion by steeping half a cup of peppermint leaves in half a cup of boiling water for 20-30 minutes. Next, add one tablespoon each of witch hazel extract, apple cider vinegar, and three drops of peppermint essential oil in it. Pour the mixture in a bottle and store it in the refrigerator. Make sure you shake the bottle thoroughly before using it. • When dealing with sunburn, steep two tablespoons of dried witch hazel leaves and bark in a cup of water for about 15 minutes, allow it cool, and apply this liquid on the affected areas two to three times in a day. • Those who have a greasy skin can apply a mixture of half a cup of witch hazel and a quarter cup of fresh lemon juice to get rid of excess oil. • Prepare a facial mask for oily skin by adding a tablespoon of witch hazel extract in a tablespoon of fuller’s earth. To enhance the beauty benefits, you may add a little honey in this paste. Apply this paste on your face and neck, and rinse it off when it dries to fade blemishes and dark spots naturally. Witch hazel can also be used to soothe cuts, burns, insect bites, sores, skin irritation, diaper rash, eczema, psoriasis, chicken pox blisters, and other skin conditions. Besides, it can be used as a cold compress to relieve headache.